A small group of passionate Sydney based photographers (Parallaxis) and I have been working towards an exhibition of our work in September this year. Enfused around the theme of “Entropy” we’ve each been interpreting and creating our bodies of work for our collective goal. It is with great pleasure I can announce that I’ve now finalised my selection of images – yay! … and decided on my wall layout for the exhibition. What is so impressive and gratifying is seeing the variation and progression in my peers work. There is such a huge variety of interpretations on our common Entropy theme. Collectively we’ve amassed an amazing and diverse array of work and I’m really looking forward to seeing the final display. I won’t give away anything about what my fellow photographers are presenting. However I’ve hinted for some months about what I’ve been working on. So it may be no surprise the teaser above is on my theme. It’s one of my unpublished images I’d been holding back for the exhibition, however it’s one of the many images which didn’t make the final cull. Our exhibition is going to be at The Art Space on the Concourse @ Chatswood (Sydney’s North Shore). From Tuesday 6th to Sunday 18th September 2016, if you can make it we’d love to see you there. For those interested in the shot above. It was taken during our amazing trip to the remote outback of the far north west region of Australia. Here we are in Hidden Valley (Mirima) National Park just outside the town of Kununurra. There was a bright moon in the sky behind and to my right, lighting most of the landscape but also washing out the stars quite a bit. I added a little light painting of the darker foreground below with my torch. The view here is across Hidden Valley with Kununurra itself just off on the right. 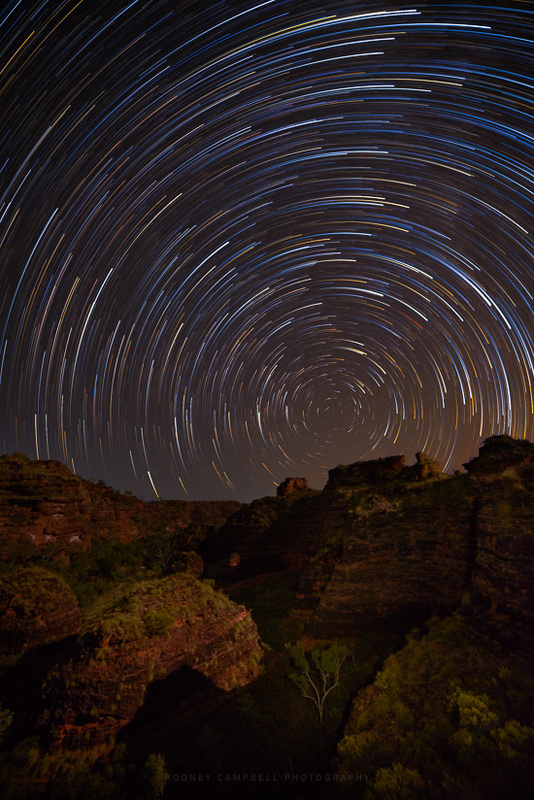 The star trails consist of 149 x 46 second frames (from 8PM till 10PM).